By Michael E. Zapadka, D.O. 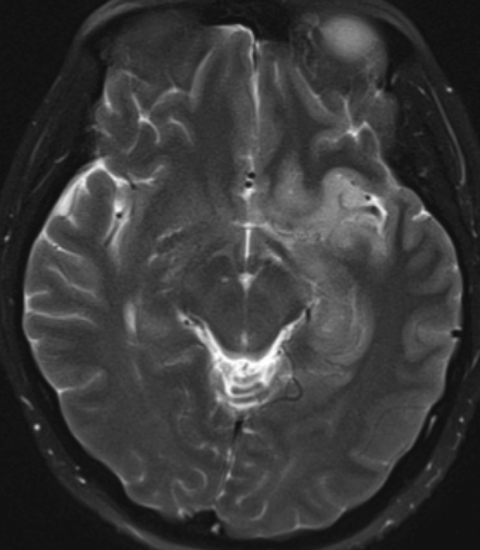 An 18-year-old man presented to the emergency department following a witnessed seizure with altered mental status. Clinical exam was limited due to patient’s status. 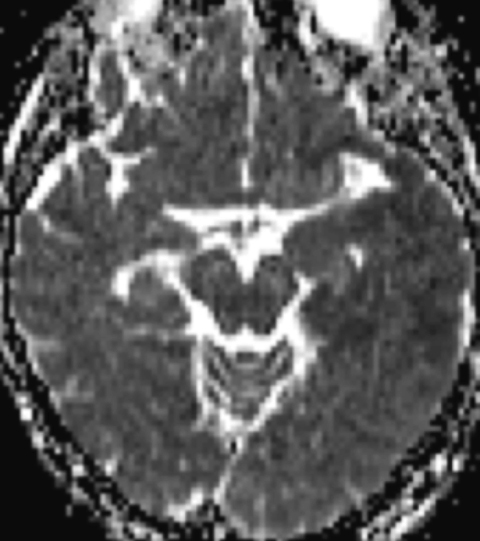 An MRI was performed (Figure 1). 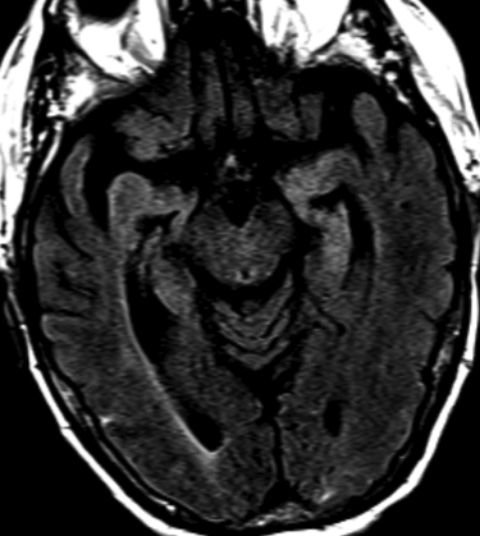 The differential diagnosis in a patient with cortically-based temporal lobe signal abnormality on MRI is broad and includes etiologies such as infection, tumor, and ischemia, among other pathological processes. Unfortunately, the imaging findings are often nonspecific with overlapping appearances. When imaging is correlated with certain key clinical features, however, the radiologist can often make an immediate and profound impact on patient care. This case discussion will highlight important entities with a predilection for the temporal lobes and limbic system. HSE has no gender predilection and may occur at any age but does follow a bimodal age distribution with one-half of cases affecting those less than 20 years of age and the other half in those greater than 50 years of age. Patients usually present with a viral prodrome including fever and headache that may progress to seizures, behavioral changes, hallucinations, and altered mental status. Despite antiviral therapy, HSE remains a devastating infection with mortality rates as high as 70%. Most survivors will have permanent neurologic sequelae. When HSE is suspected clinically or by imaging, presumptive antiviral therapy should be instituted urgently due to its high morbidity and mortality; however, polymerase chain reaction (PCR) is necessary for definitive diagnosis. The imaging findings are nonspecific, but HSE characteristically involves the limbic system to varying degrees. 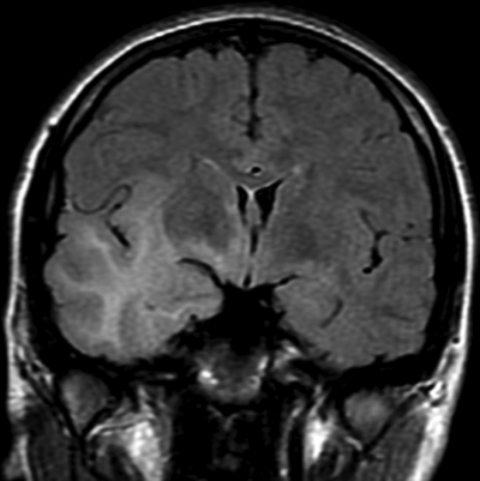 The anterior and medial temporal lobes, insula, subfrontal region, and cingulate gyri are most often affected and are frequently bilateral and asymmetric.2 While medial temporal lobe abnormality often prompts the radiologist to suggest HSE, it is important to remember that any portion of the limbic system may be involved in isolation. 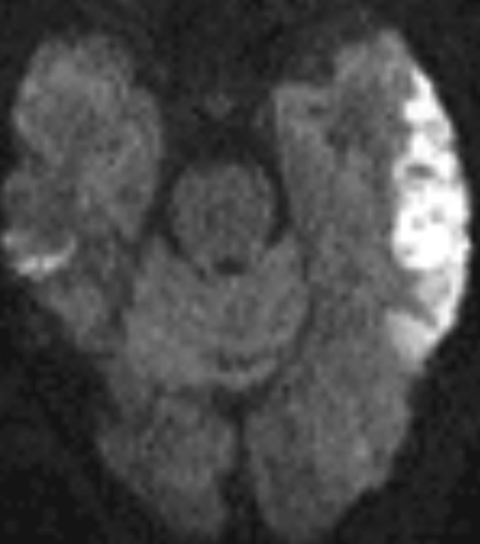 Noncontrast CT may be normal in the early stage of HSE, or an abnormality may be very difficult to detect, in part due to beam-hardening artifact obscuring the medial temporal lobes. 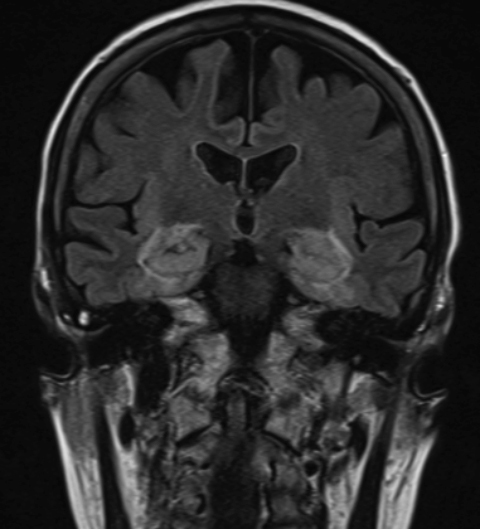 However, recognizing edema or mass effect involving the medial temporal lobe, insula, or other portions of the limbic system should prompt the radiologist to specifically suggest HSE in the differential diagnosis. It is also imperative to directly communicate as much with the referring clinician, since prompt diagnosis and treatment are critical to preventing severe neurologic sequelae. Anti-NMDA (N-methyl-D-aspartate) receptor encephalitis is another form of autoimmune encephalitis that has gained much attention recently. This entity was originally described in adult women with underlying ovarian teratoma, but is now recognized in adult men and children even in absence of a systemic neoplasm.5 Clinical features include an initial prodrome of fever, headache, vomiting, and diarrhea. Psychiatric symptoms include anxiety, paranoia, and insomnia. Ultimately, psychosis may develop within weeks of the prodromal phase in addition to movement disorders, seizures, cognitive decline, and autonomic dysfunction. Diagnosis is confirmed by the presence of NMDA receptor antibodies in serum or CSF. 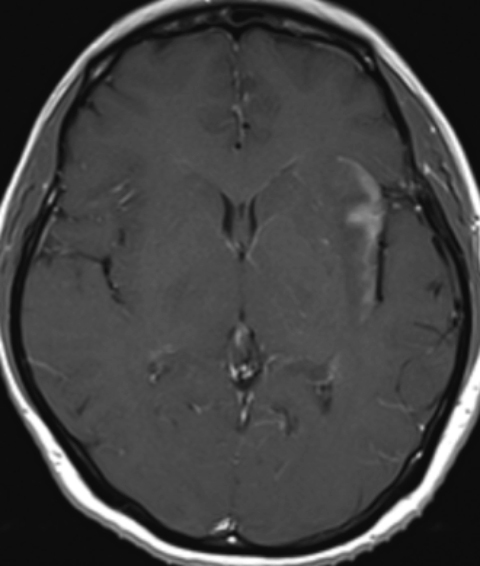 CT has poor sensitivity for detection of this entity, and MRI is the study of choice; however, even MRI may be negative in 50% of confirmed cases. 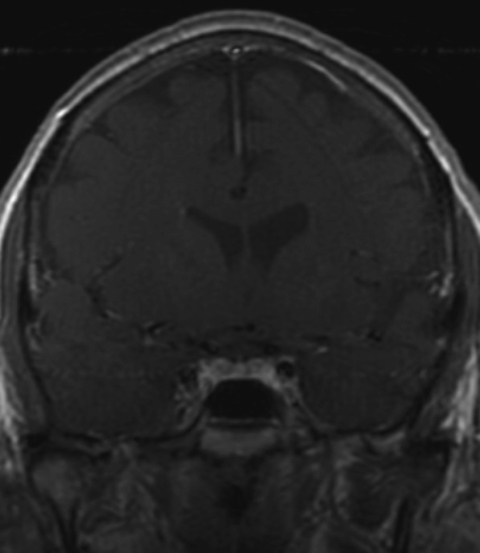 When present, MRI findings include T2/FLAIR hyperintensity within the hippocampus; cerebellar, frontobasal or insular cortex; basal ganglia; brainstem; and occasionally the spinal cord.5 Contrast enhancement may be present within these regions of signal abnormality and occasionally, abnormal meningeal enhancement may be identified. 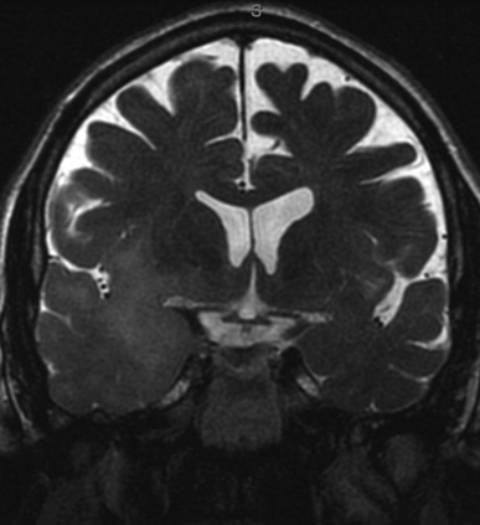 Recent literature suggests anti-NMDA receptor encephalitis is more common than previously recognized, but unfortunately, the diagnosis based on neuroimaging alone is very difficult. When diagnosed early, this represents a treatable form of autoimmune encephalitis. Therefore, it is important for the radiologist to be familiar with this entity when interpreting an imaging study that demonstrates findings of limbic encephalitis. While this autoimmune encephalitis may occur in the absence of systemic neoplasm, screening for ovarian teratoma in females or testicular or small cell lung carcinoma in males, should be recommended. Gliomatosis cerebri represents a rare, diffusely infiltrative glial neoplasm that may arise de novo, from a previous astrocytoma, or less commonly from an oligodendroglioma. These are aggressive neoplasms with WHO grades ranging from II-IV (most are WHO III).2 By definition, at least three lobes of the brain are involved (updated WHO classification) with common extension into the basal ganglia and deep cerebral white matter. Gliomatosis can occur at any age but there is a peak presentation between ages 40 and 50.6 Clinically, patients may present with cognitive or behavioral decline, headaches, seizures, or other focal neurologic derangement that is generally more insidious in onset than herpes encephalitis. Prognosis is poor, and given its diffusely infiltrative behavior, these are nonresectable. Chemotherapy and radiation treatment have not had a positive impact on overall survival. CT has a limited role in evaluating for gliomatosis because the findings may be completely unapparent or at least very subtle. 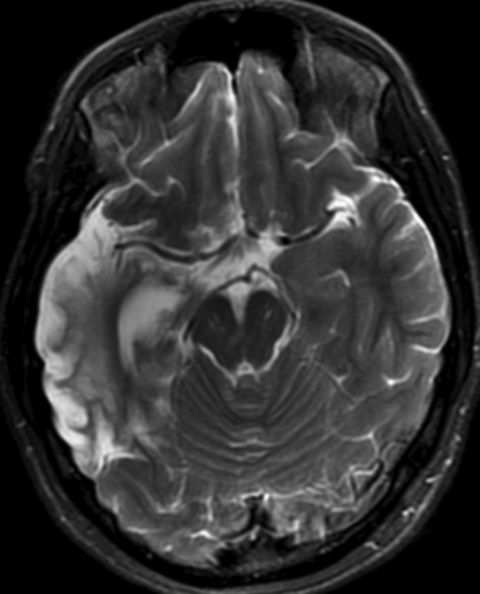 Potential abnormalities include hypodense regions in the white matter associated with subtle mass effect and poor gray-white differentiation. Enhancement is usually not detected on postcontrast CT.
MRI is the imaging modality of choice. 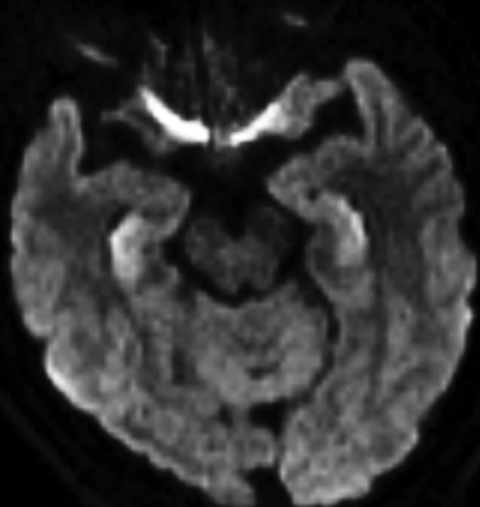 Findings typically include extensive T2/FLAIR hyperintense, infiltrative signal abnormality with relatively mild associated mass effect (Figure 5). T1 changes are less conspicuous with areas of signal abnormality that are iso- to hypointense relative to normal gray matter. Despite widespread infiltration of the white matter, white matter architecture is otherwise often preserved. Enhancement is absent or minimal; however, when present, areas of enhancement or restricted diffusion suggest a higher-grade tumor. 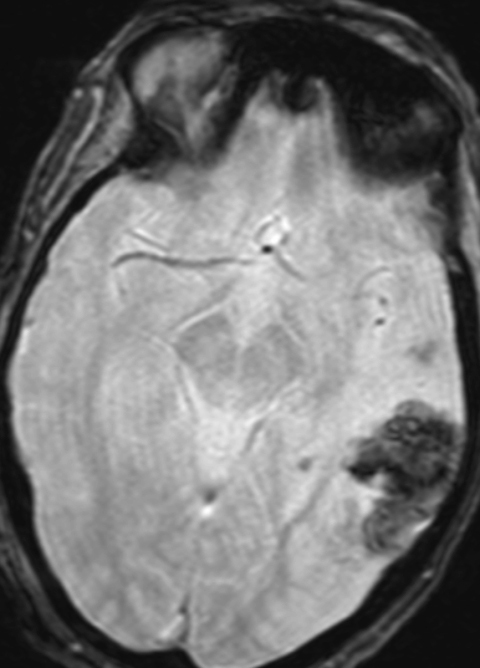 In general, gliomatosis lacks the vascular proliferation and necrosis typical for high-grade glial neoplasms, which likely accounts for the lack of enhancement or increased rCBV (relative cerebral blood volume) on perfusion.7 MR spectroscopy may show typical tumor-like spectra with reduced NAA (N-acetylaspartate) and elevated choline. Following a generalized tonic-clonic seizure or status epilepticus, transient and reversible signal changes may occur in the region of epileptic discharge. These signal changes are thought to result from vasogenic and cytotoxic edema induced by seizure activity.8 In the acute setting, these signal changes could be mistaken for infiltrative tumor, infarction, or encephalitis. 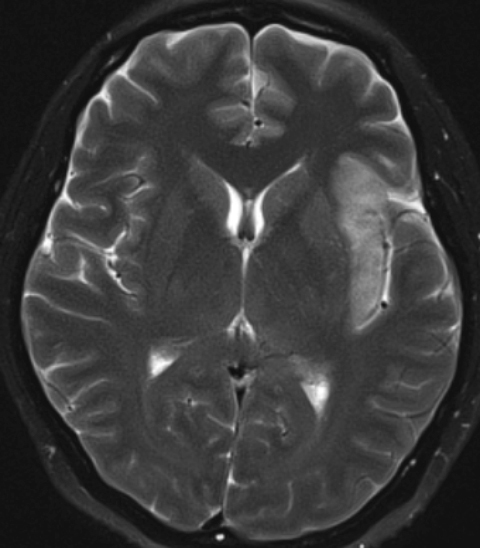 The key to this diagnosis is not only the appropriate clinical history of seizure, but also demonstrating reversibility on follow-up imaging. CT has a limited role in evaluating parenchymal abnormalities in the setting of seizure, and MRI is again the modality of choice. Imaging features will vary based on acuity and overall severity of seizure activity. 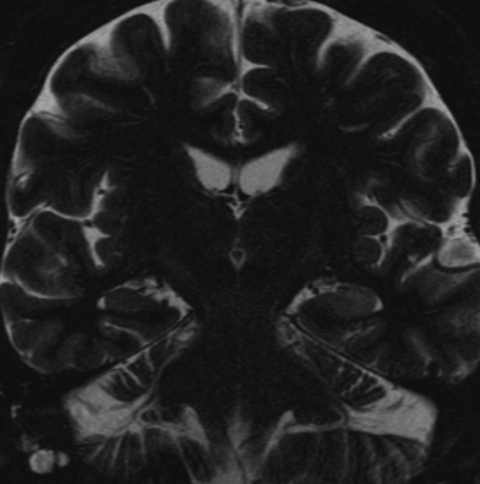 Common MRI findings include T2/FLAIR hyperintensity and swelling of involved cortical gyri, hippocampus, and occasionally the ipsilateral thalamus and basal ganglia (Figure 6). 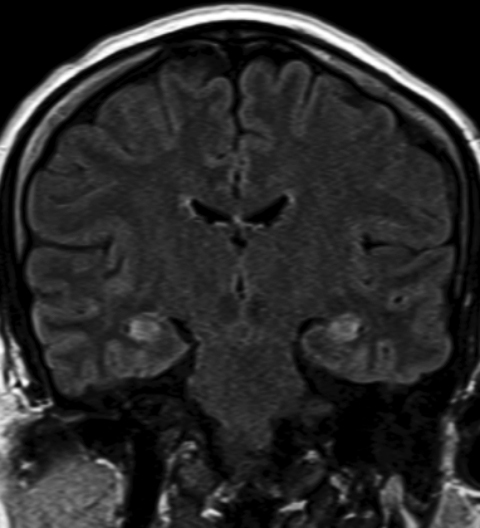 The subcortical white matter may be involved to some extent, but signal abnormality tends to predominate in the cortex. Restricted diffusion is often present (Figure 6A and 6C), although its reversibility suggests that cytotoxic edema alone does not account for the diffusion restriction. Increased MR perfusion and minimal enhancement may be present as well at postictal imaging (Figure 6G). 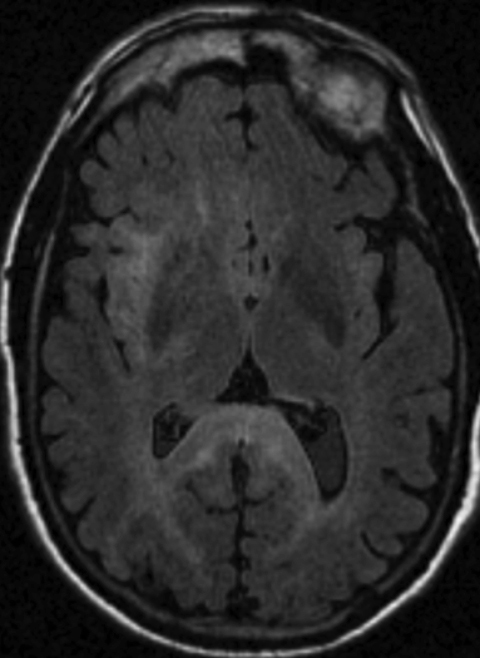 Most of these peri- or postictal signal abnormalities will normalize within days; however, cortical atrophy, laminar necrosis, mesial temporal sclerosis and gliosis may be identified in the chronic setting. Acute or subacute cerebral infarction is an important cause of gyral swelling and signal abnormality within the temporal lobe and elsewhere. Most infarcts are arterial in origin, which may result from thrombosis of vulnerable atherosclerotic plaque in a large vessel, small vessel occlusion, or cardioembolic events. As with the other entities discussed, MRI is far more sensitive than CT in detecting acute ischemia or infarction. 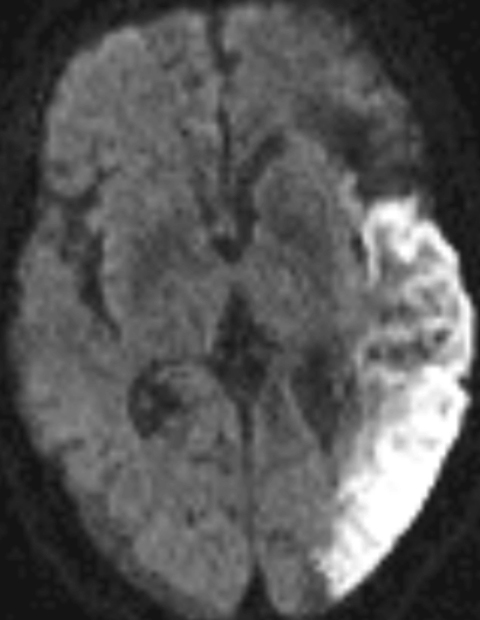 On imaging, both gray and white matter are often involved with a thromboembolic infarct, characteristic of cytotoxic edema (Figure 7). Diffusion restriction precedes T2/FLAIR signal abnormality, which is a notable differentiating feature from postictal gyral edema (in which case T2/FLAIR hyperintensity and restricted diffusion occur simultaneously). An important feature of arterial origin thromboembolic infarcts is involvement of a specific vascular territory. For the radiologist, understanding the normal cerebral arterial vascular distributions is vital. This is particularly important when temporal lobe signal abnormality is encountered since there is mixed arterial supply. Specifically, the posterior cerebral artery (PCA) supplies the inferomedial temporal lobe, the middle cerebral artery (MCA) supplies the lateral and superior temporal lobe, and the anterior choroidal artery supplies a portion of the hippocampus. Most cerebral infarctions are “bland” or nonhemorrhagic, but hemorrhagic transformation may complicate ischemic infarcts, usually in the first 24 hours following reperfusion therapy, or spontaneously over a few days or first week following infarct ictus. 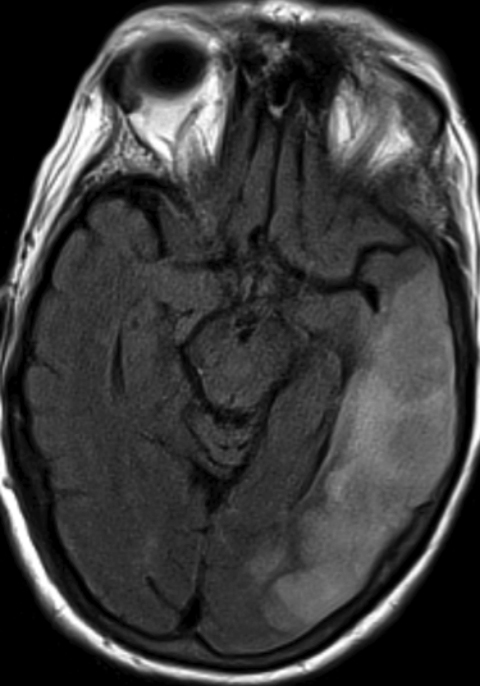 Petechial hemorrhage appears as punctate foci of hemorrhage within the cortex or basal ganglia without mass effect and likely reflects tissue reperfusion.2 Petechial hemorrhage occurs far more frequently than parenchymal hematoma formation and generally does not alter patient prognosis or therapy. However, gross hematoma formation does carry increased morbidity and decreased survival. Spontaneous hemorrhagic transformation is seen more commonly in cardioembolic origin infarcts with additional risk factors for hematoma formation, including thrombolytic therapy, large infarcts, and hyperglycemia. 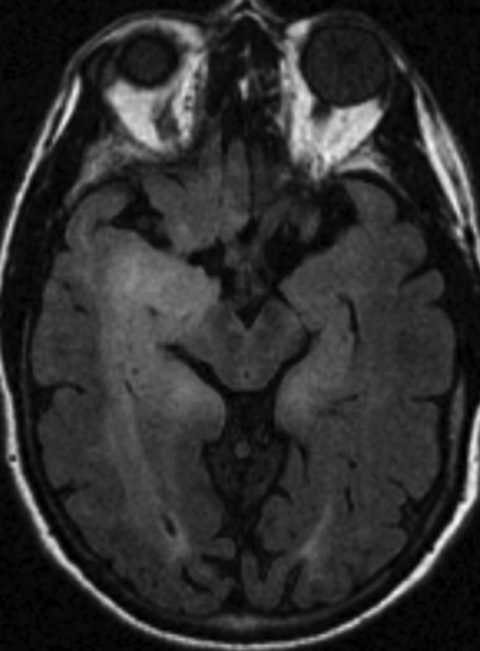 Occlusion of dural venous sinuses and/or cerebral veins is a rare cause of acute “strokes”; however, the radiologist may be the first to suggest or make the diagnosis given the elusive nature of its clinical presentation. Common patient signs and symptoms include headache (seen in 90% of patients), nausea, vomiting, seizure, and altered consciousness.9 Veno-occlusive disease tends to affect younger individuals and is more commonly seen in females with the following risk factors: oral contraceptives, pregnancy, hypercoagulable states, dehydration, drugs, infection, and trauma (among others). Formation of thrombus within a dural sinus, cortical vein, or deep cerebral vein impairs venous outflow. Consequently, venous pressures become elevated, resulting in venous congestion and parenchymal ischemia. Venous infarcts have a relatively high propensity for hemorrhagic transformation (30-40%), and an important distinguishing feature is that they will cross normal arterial vascular territories.9 The region of infarct can be predicted by the dural sinus or veins occluded. For instance, superior sagittal sinus occlusion results in bilateral, parasagittal frontal, parietal and occipital lobe infarcts; transverse and sigmoid sinus occlusion results in temporal and occipital lobe infarcts; vein of Labbe occlusion results in temporal lobe infarcts; and vein of Galen or straight sinus occlusion can result in infarcts of the bilateral thalami and basal ganglia. On noncontrast CT, a clot within the dural sinus or vein will appear hyperdense, while on MRI, the appearance of thrombus will vary depending on its age. Postcontrast imaging is very useful to detect thrombus, which appears as a “filling defect” within an otherwise opacified venous structure. 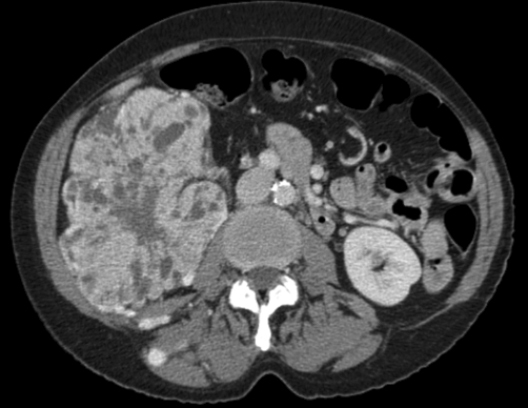 CT or MR venography are also frequently utilized protocols when veno-occlusive disease is suspected clinically or to clarify findings on noncontrast imaging. 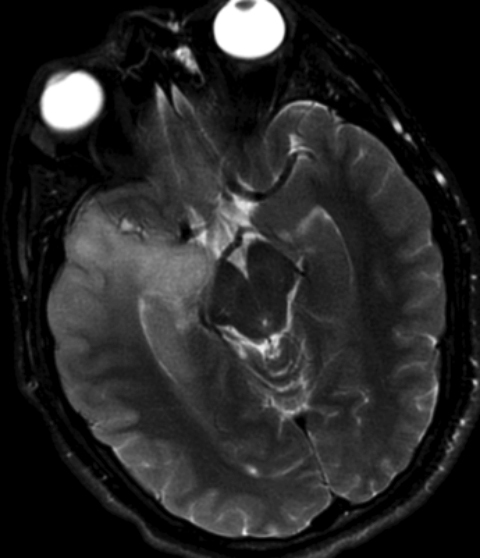 It is important for the radiologist to be aware of certain imaging pitfalls that mimic venous occlusion including variant venous sinus anatomy, arachnoid granulations, or flow-related artifacts on MRI. 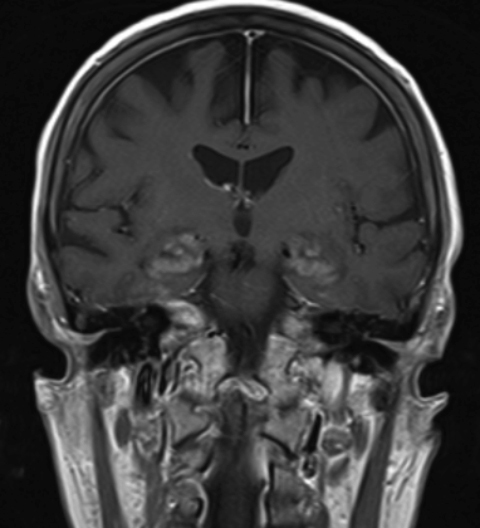 Herpes simplex encephalitis (HSE) is a potentially devastating neurologic disease; therefore, it is imperative that the radiologist recognize and communicate this diagnosis to the referring clinician for urgent anti-viral therapy. 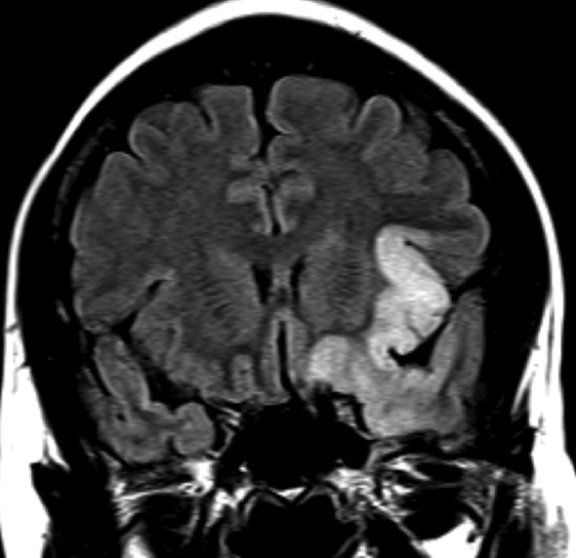 Other imaging considerations that can mimic HSE include other autoimmune encephalitides, gliomatosis cerebri, postictal gyral edema, and acute cerebral infarction. Knowledge of the timing and nature of clinical presentation can assist the radiologist in differentiating these potential entities as being more or less likely. National Institute of Neurological Disorders and Stroke. Meningitis and encephalitis fact sheet. 2004. Retrieved from http://www.ninds.nih.gov/disorders/encephalitis_meningitis/detail_encephalitis_meningitis.htm. Accessed December 22, 2014. Osborn AG. Osborn’s brain: Imaging, Pathology and Anatomy, 1st ed. Philadelphia, PA: Lippincott Williams & Wilkins, 2012. Asztely F, Kumlien E. The diagnosis and treatment of limbic encephalitis. Acta Neurol Scand 2012; 126(6): 365-375. Gultekin SH, Rosenfeld MR, Voltz R., et al. 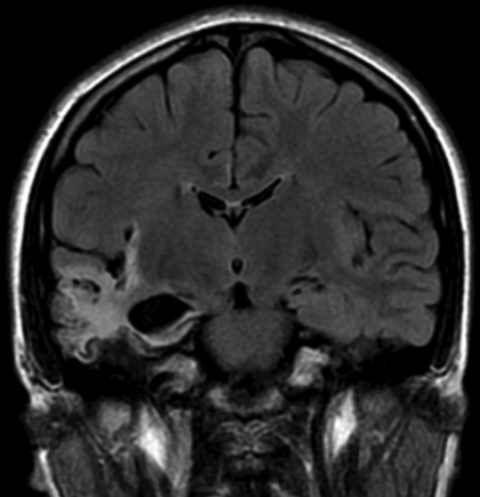 Paraneoplastic limbic encephalitis: neurological symptoms, immunological findings and tumour association in 50 patients. Brain 2000; 123(7):1481-1494. 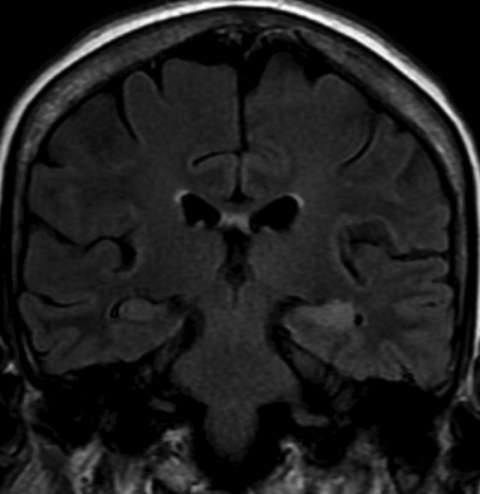 Jones KC, Benseler SM, Moharir M. Anti-NMDA Receptor Encephalitis. Neuroimag Clin N Am 2013; 23: 309-320. Rajz GG, Nass D, Talianski E. et al. Presentation patterns and outcome of gliomatosis cerebri. Oncol Lett 2012; 3(1):209-213. Yang S, Wetzel S., Cha S. Dynamic contrast-enhanced T2*-weighted MR imaging of gliomatosis cerebri. 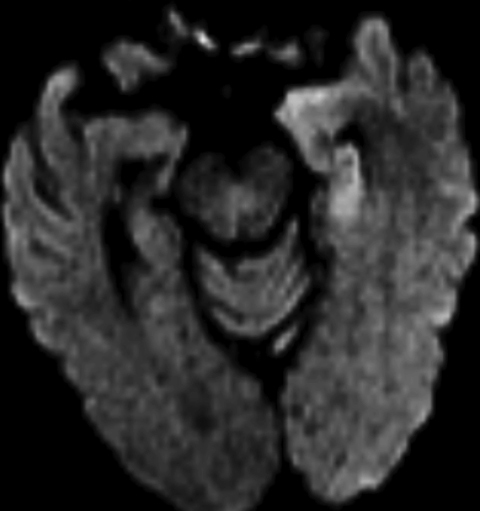 AJNR Am J Neuroradiol 2002;23: 350-355. Kim J, Chung JI, Yoon PH, et al. Transient MR signal changes in patients with generalized tonicoclonic seizure or status epilepticus: periictal diffusion-weighted imaging. Am J Neuroradiol 2001; 22:1149-1160. Saposnik G, Barinagarrementeria F, Brown RD Jr, et al. Diagnosis and management of cerebral venous thrombosis: a statement for healthcare professionals from the American Heart Association/American Stroke Association. Stroke 2011; 42:1158-1192. Temporal Lobe Signal Abnormality. J Am Osteopath Coll Radiol. Dr. Zapadka is with the Department of Radiology, Wake Forest Baptist Health, Winston-Salem, NC.